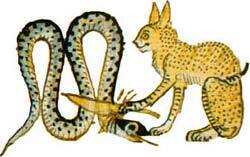 Apep was a huge serpent (or crocodile) which lived in the waters of Nun or in the celestial Nile. Each day he attempted to disrupt the passage of the solar barque of Re. In some myths, Apep was an earlier and discarded sun-god himself. This helps to explain the snake's strength and his resentment of the daily journey of the sun. In Seth's battle for the throne of Egypt, he claimed that he was stronger than Horus because it was he that stood at the prow of the solar barque and defeated the enemies of Re. Apep was a genuine threat to Re and his daily travels. At times he was successful and when this occurred stormy weather would occur. When Apep swallowed the barque, there was a solar eclipse. He never had a lasting victory though because of the prayers of the priests and religious. A book called, The Books of Overthrowing Apep contained a list of his secret names and a number of hymns that celebrate Re's victories. According to the book, Apep had been previously killed, hacked to pieces, dismembered and thrown into the abyss. However, he always came back to life to attack Re the next day. Egyptians would go to the temples and make images of snakes out of wax. They would spit in the images, then burn and mutilate them. Doing this and reciting the spells in the Books of Overthrowing Apep helped ensure Re's continued success and victory over the snake. Following books describe in detail the destruction which will fall upon Apep. According to these, Apep will first be speared, then sliced with red-hot knives so that every bone of his body has been separated, his head, legs and tail are cut off. His remains are then scorched, singed, and roasted, finally to be consumed by fire. The same fate awaits Apep's confederates and everything which formed parts of him, them, and all their offspring (their shadows, souls, doubles, and spirits).